There's something very moving about this collage, but I have no idea why or what. You have really captured my attention all over again with these collages. there is something deliciously mysterious about this piece. I love the knot as symbol in the centre. It kind of reminds me of my bag of rune stones. I'll have to check and see if indeed there is a knot there! 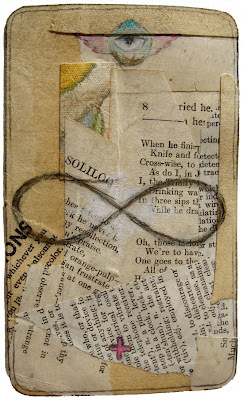 Lynne your collage card are wonderful, love the layers of old and different papers. Beautiful-and I love the quote! Love this! love the depth and the mystery . . . The rounding of the corners makes such a difference in the composition, I've been making collage postcards all week so this is something that I can see that elevates the piece somehow. Maybe I'm thinking about the metaphor of rounding a corner in my own life right now. Of course I love the rest of the piece as well but funny how certain elements speak more loudly depending on where the viewer is at. Your work "infinitely" inspires me Lynne. Love your collage and quote.. Happy Weekend, Lovely Grown-up Artist Friend ! I like that all seeing eye at the top looking over infinity. The symbol reminds me of old rope, or even a lock of hair? How you are blessed with inspiration. Thank you for sharing.